BELIZE CITY, Wed. Nov. 25, 2015–Economic growth so far in 2015 is lagging way behind last year’s, with the Gross Domestic Product contracting by 1.0% between July and September, according to data released by the Statistical Institute of Belize (SIB) today at a press conference held in Belize City this morning at the Best Western Belize Biltmore Plaza. The SIB reported an exceptional 3rd quarter in 2014, said to be the highest growth rate of any 3rd quarter period for the country since 2009, registering growth of 4.8%, well above this year’s reported 1.0% contraction. It, therefore, projected a GDP growth for 2015 of 2.0% and 2.5%. Jefte Ochaeta, Statistician I, told the press today that the country’s GDP grew an estimated 1.2% for the first 9 months of 2015. There were major declines in fishing (which fell by about $25.9 mil) and agriculture (which fell by about $6.4 mil), resulting in decelerated GDP growth in 2015. Government services expanded by roughly 13% in the 3rd quarter largely due to an increase in salary payouts to reflect salary adjustments. 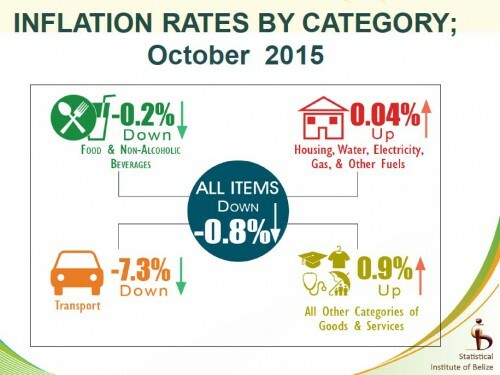 Meanwhile, Angelita Campbell, Statistician II, reported that Belize’s inflation rate for the month of October stands at -0.8%, which means that on average, prices are 0.8% lower than they were in last October. The decline in the transport category of 7.3%, especially a substantial fall in the price of gasoline and LPG for cooking, was largely responsible for pushing the inflation rate down. Tiffany Vasquez, Statistician II, reported on external trade. According to Vasquez, Belize imported goods totaling $1.7 billion—an increase of 3.1% or $51.4 million from the same period last year. On the other hand, Belize exported goods totaling $477.2 million—a decrease of 13.2% or $72.4 million from $549.6 million recorded for the same period last year. There was a substantial decline in crude petroleum exports, which dropped in value by 63%, and in volume by 25%. Receipts from crude petroleum, said Vasquez, fell by roughly $55 million. 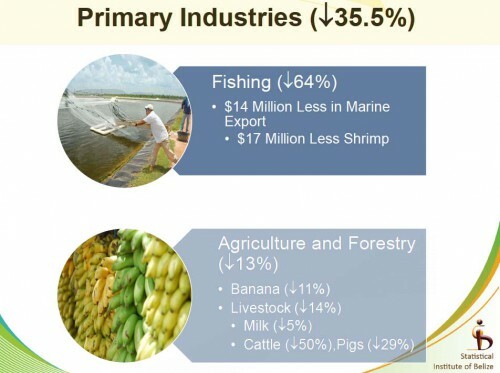 The other major decline was seen in the marine sector, with a fall in production by $15.7 million. 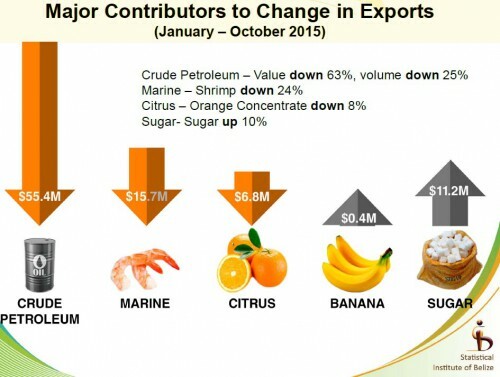 Sugar production was up by 10%, while the production of orange concentrate was down by 8%. Also released today were the latest labour force stats, which have been compiled based on a survey of 2,800 households with an even distribution across the six districts. There are an estimated 18,730 persons underemployed, 15,907 persons unemployed, and 9,822 persons grappling with long-term unemployment for 27 weeks or more.